Breslin Builders provided both full in-house design and construction services for this project working closely with Allegiant Travel Company’s (the parent company of Allegiant Air) facilities management director, on the various requirements of the project. The nearly 75,000 square foot building houses all areas needed for a growing publicly traded national airline company and required stringent design requirements in some areas to comply with FAA requirements. The building has been designed as a standard core/shell space with build-to-suit requirements in the office areas. The office areas have taken advantage of the open office feel and a combination of exposed structure (steel beam, open web joists, painted metal decking), exposed ducting including fabric ducting, and expansive exterior glazing walls to create a truly unique office environment. 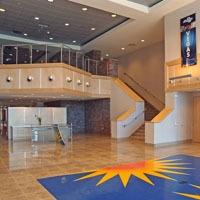 In addition to the open office feel the lobby was designed with unique features including a front desk design to replicate to scale the tail section of an MD-80 (the choice of aircraft flown by Allegiant Air). Breslin Builders provided shell and tenant improvement construction services for this 75,000 square foot two-story office project in Summerlin, Las Vegas, Nevada. Designed to mirror the existing building to the east, this project was fast tracked to take advantage of the growing office needs of the Summerlin area. This project was completed as a design-build project with WPH Architecture Inc. Breslin Builders provided the tenant improvement build-outs within the building also, including the Vintner Grill restaurant project. Breslin Builders provided both full in-house design and construction services for this Class “A” multi-tenant two-story office building. The building is similar in design to the Allegiant Air Office Building located to the east of this project and matches design features and materials as part of the overall Durango Commons mixed-use office/retail development. 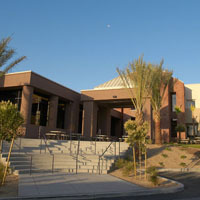 The project is located on South Durango Drive in Las Vegas, Nevada, just south of Windmill Lane. The type II-B steel structure building contains approximately 56,305 square feet. Additionally, Breslin Builders has provided tenant improvement designs and build-outs for the various tenants in the building including training space for Allegiant Air, headquarters for CommPartners, and office space for Flynn-Gallagher. This project has been awarded a LEED Core & Shell v2.0 Silver rating. Breslin Builders Design Group was the LEED Administrator for the project overseeing the certification process with the GBCI and USGBC. Breslin Builders provided construction services for MGA Law Office’s new space in the southwest part of the Las Vegas valley. The 6,800 square project designed by designcell Architecture, has various offices, multiple conference rooms, a large high ceiling lobby/reception area, taking full advantage of the shell building features it was constructed within. Photos of the project can be found in an album on our Flickr site. 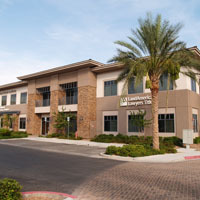 Breslin Builders provided construction services for this new space in Summerlin. The 4,600+ square project designed by designcell Architecture, has various offices, multiple conference rooms, a unique lobby/reception area, with lots of full to ceiling glass walls for an open office feel. With exposed ceilings and polished concrete floors, the space is designed to highlight the shell structural features of the building, creating a unique space to work in. 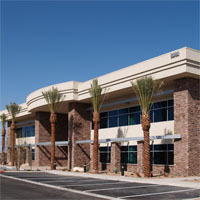 Breslin Builders provided construction services for the 9,700 square foot first phase of Meadows Bank at The Park at Spanish Ridge, located in the southwest part of the Las Vegas valley. Featuring many unique finishes including recycled wood beams, acrylic panels, bamboo flooring, and granite tops, to name a few, this bank interior build-out is a step above other bank lobbies in the valley. Breslin Builders constructed Phase Two of the project which includes expanded office and board room facilities. We also provided design-build services for Phase III, the final office build-out, within their main office and headquarters. In addition to work at their headquarters, Breslin Builders provided design-build services for their Henderson Branch located at St. Rose Parkway and Eastern. This 3,300+ square foot tenant improvement, which was completed in 2012, was a partial remodel to an existing space within an existing inline retail space. 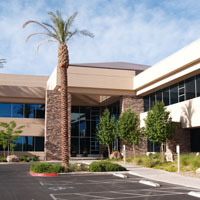 St. Rose Business Park is a master planned multi-building office complex in Henderson, Nevada. 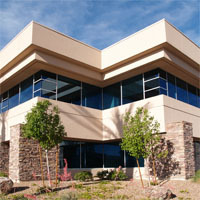 Buildings vary in size and use creating a unique office environment. Breslin Builders provided the on-site development and completed seven of the pad building sites to date. 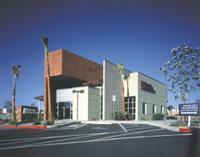 Breslin Builders provided construction services for this unique bank design located at Boca Park at Charleston and Rampart in Las Vegas, Nevada.